"Hope is the thing with feathers that perches in the soul and sings the tune without the words and never stops at all," by Emily Dickinson. That is what my necklace reads. I actually won it a few years ago and didn't wear it much, but recently I've been pulling it out more. It's serves as a reminder that even when the going is tough, there is always hope. Thinking about hope keeps us all positive and looking forward to the future. A positive attitude and positive mindset can move mountains. It helps you handle stress better and helps to keep things in perspective. So my wish for you today is to stay hopeful and positive no matter what this Monday throws at you! What helps you stay positive? Do you have a quote, memory, or item that serves as a reminder to you to have hope? Such a pretty look, love your skirt. Love this pretty skirt! What a nice piece of jewelry to have. To stay inspired, I go to certain scripture verses. What a great message. Have a great week. Love the inspiring message on your necklace and your gorgeous skirt! I usually go to quotes or certain books if I need a boost. It is a great reminder Laura because in the scheme of things, we are quite blessed. I'm not sure why the little blips continue to annoy us, but I know I need these great sayings to put life into perspective! Thanks for your positive thoughts this morning Laura, I hope your thoughts help to make your week a good one. I need those shoes in my life! SO fab! Great color on your skirt. 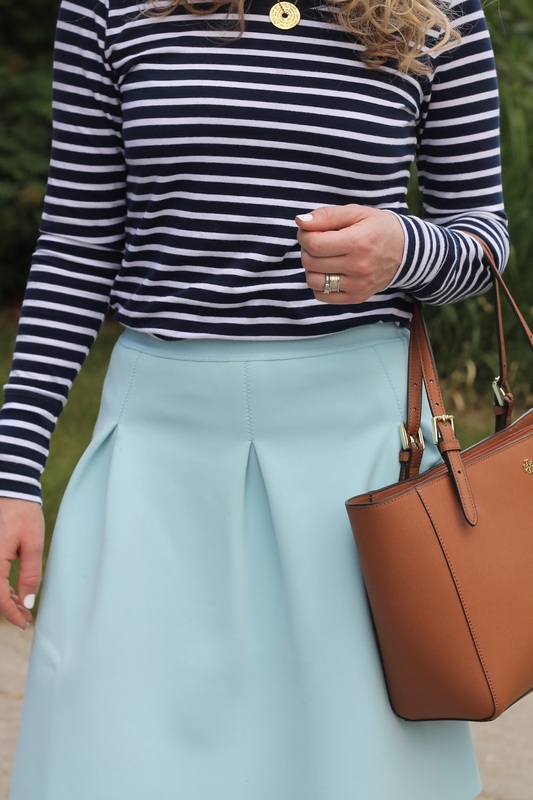 Loving that mint skirt! So perfect with your stripes. Hope has been such a crucial thing for me in life, especially as we walked through infertility. So pretty! Love your skirt, the color is gorgeous! What a great quote to keep you on track! I have recently been trying to keep things more positive too :) Great look (as always!!!). Super cute as always! 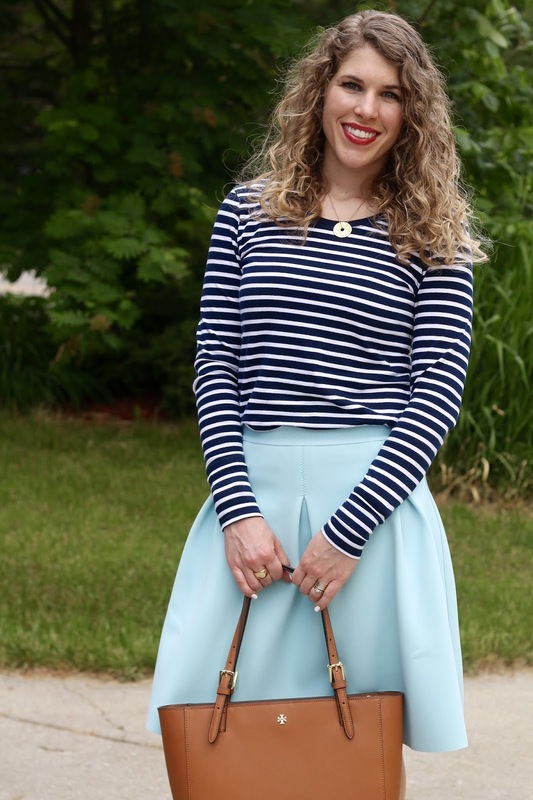 Love your skirt and the striped top together! That is a beautiful message and a great one to wear on such a pretty necklace. 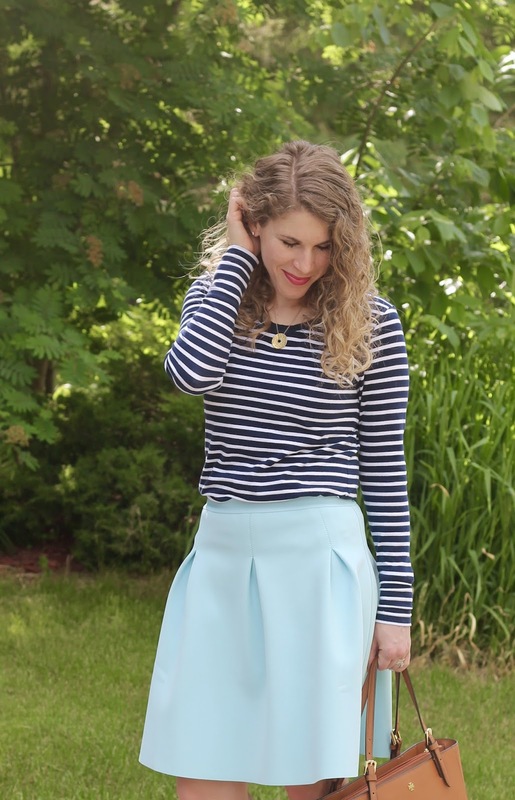 I just adore that mint skirt and how you styled it!